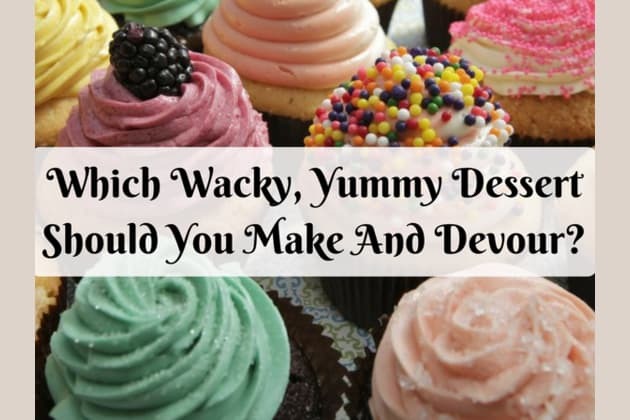 Which Wacky, Yummy Dessert Should You Make And Devour? On a scale of 1-4, how much do you like cupcakes? On a scale of 1-4, how much do you like chocolate? On a scale of 1-4, how would you rate pie? On a scale of 1-4, how would you score wedding cake? On a scale of 1-4, how good are you at decorating desserts? On a scale of 1-4, how much do you enjoy pastries? BONUS! Pick your fave cooking show! You should make cotton candy cupcakes! Cotton Candy Cupcakes: fun, unique cupcakes flavored just like cotton candy! Preheat oven to 350 degrees F. Line 2 muffin tins with 18 paper liners; set aside. Meanwhile, prepare your cake batter: combine the cake mix, egg whites, oil, water, and cotton candy flavoring with an electric mixer until smooth, about 2 minutes. Divide the batter evenly among two bowls and tint each bowl with your desired shade of blue and pink (I only did one drop of coloring per bowl for a more pastel look). Evenly distribute the colors among each muffin cup, filling about ¾ full. Don't swirl the batters, just layer them. Swirling the batters together may muddy the colors. Bake for approx. 15-18 minutes or until a toothpick inserted near the center comes out clean or with moist crumbs. Cool completely. For the frosting, cream the butter, cotton candy flavoring and vanilla extract together in the bowl of a stand mixer until smooth, about 1 minute. Gradually add in the confectioners' sugar, about one cup at a time, alternating with little streams of the heavy cream until the frosting is light and fluffy. Divide the frosting evenly among two bowls and tint each bowl with blue and pink until your desired shade has been achieved. (Again, I did one drop of each color). Pipe the frosting onto the cooled cupcakes and top with a sprinkling of blue and pink sanding sugar. To make the cotton candy sticks, rip off a small piece of cotton candy and attach it to the wet end of a popsicle stick (just stick the popsicle stick tip in a little water). Serve immediately with the cotton candy sticks, but keep in mind- cotton candy, once exposed to air, hardens quickly. It's best to make the cotton candy sticks immediately before serving. You should make s'mores brownies! Press into bottom of baking sheet, and set aside. In a heavy sauce pan melt butter and stir in white and brown sugars, stir over medium heat for about 1-2 minutes until sugar starts to dissolve. Add eggs in one at a time, and whisk them into the sugar butter mixture. You should make chocolate orange layer cake! Chocolate Orange Layer Cake - The perfect alternative to a festive fruit cake for Christmas. Lovely layers of chocolate, sandwiches with orange flavoured chocolate buttercream. It's not Terry's... It's mine! You should make honey chiffon lemon pie! Line a rimmed baking sheet with parchment paper. Line the chocolate covered raisins in rows. Place the white chocolate melting wafers and a few drops of food coloring in a microwave safe bowl. Microwave to melt according to package directions. Mix until smooth and yellow. Dip a fork into the melted chocolate and then quickly wave the fork over the chocolate-covered raisins, back and forth, drizzling over the melted yellow chocolate to create stripes. Dip the ends of the almond slices into the remaining melted chocolate and press the almond slices onto the sides of the chocolate-covered raisins to create wings. Allow the chocolate to set before moving the bees. Meanwhile, make an ice bath ready by partially filling a large bowl with ice cubes and cold water. Pour 1/4 cup cold water into a saucepan and sprinkle all over with gelatin. Let the mixture sit until the gelatin absorbs all of the water, about 5 minutes. Stir in 3/4 cup of the honey, and then whisk in the salt, 3/4 cup of the lemon juice, lemon zest, and egg yolks. Place the saucepan over medium heat and cook for about 6-8 minutes, stirring constantly, until the mixture has thickened slightly. Don’t let the mixture come to a full boil. It will continue to thicken much, much more as it cools. Immediately transfer the saucepan to the ice bath to let cool until the lemon mixture is cold to the touch. Whisk occasionally to make sure the mixture is cooling evenly. Beat 1 1/2 cups of the cream with 1/4 cup of the confectioner’s sugar until soft peaks form. Mix in the vanilla extract and beat again until stiff peaks form. Fold the whipped cream, a bit at a time, into the cooled lemon mixture. Keep folding until smooth and well-combined. Pour the mixture into the prepared crust and smooth the top. Firmly press the bubble wrap, bubble-side down, onto the surface of the pie. Make sure that the filling has filled in all of the crevices in between the bubbles to get the neatest indentations. Transfer the pie to the freezer for at least 4 hours, to set. Once you can peel the bubble wrap off without disturbing the filling, it’s ready to glaze. In a microwave-safe bowl, combine the remaining honey and lemon juice and microwave for 30 seconds, or until softened. Mix well and brush over the top of the frozen pie. Refrigerate the pie for an hour to thaw. In a large bowl, whisk the remaining cream and confectioner’s sugar until stiff peaks form. Spoon the whipped cream on top of the pie and decorate with the honey bees, lemon wheels, and flowers. Serve. It's time for a sugar rush!